The pictures we've all been waiting for are finally here. We've got our first look at the Disney remake of Aladdin! 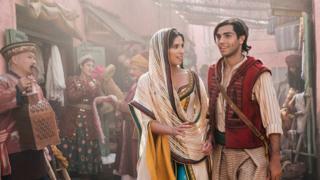 In the images revealed exclusively to magazine Entertainment Weekly, we get a look at all of the main characters, as well as the set for the bustling streets of Agrabah, where the story unfolds. Guy Ritchie, who is directing the film, told the magazine that "making a kids' film was very appealing to me", given that he has five children of his own. So what else did we learn? Apparently Ritchie had to hold hundreds of auditions, which took six months! Camila Cabello does Harry Potter! Ed vs Taylor: Who came out on top in 2018? In the end, 27-year-old Canadian actor Mena Massoud and British actress Naomi Scott, 25, who is known for her role in Power Rangers, landed the main parts. Marwan Kenzari is taking on the role of Jafar, while Fresh Prince and Men in Black star Will Smith will play the iconic genie. 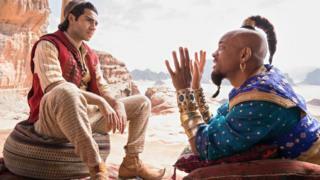 You might think that the film would have been made in a country that resembles the fictional Agrabah from the original film. 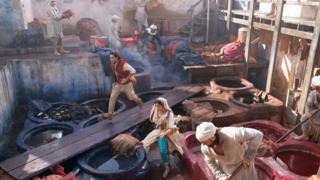 But production designer Gemma Jackson told EW that this is not what happened at all. In fact, she and her team built a lively, dusty Agrabah set that is about the size of two football fields in... Surrey in south-east England! Would you believe that all of this was filmed just outside of London? She drew inspiration from Moroccan, Persian, and Turkish cultures, as well as Victorian paintings and Iznik ceramics. 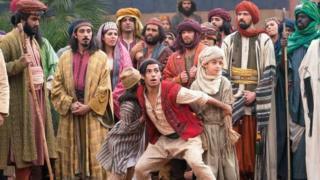 Remember those scenes in the bustling streets of Agrabah? Well, there will be around 500 extras from diverse backgrounds to fill the town. Mena - who is Egyptian-Canadian - explains how he's proud to be part of a film "that represents so many visible and ethnically different cultures". "The singing and dancing I had to really train and put in time for, as I'm predominantly an actor first," Mena told the magazine. But he's also had to learn to ride a camel and scuba dive! Naomi was really excited to take on the role of Jasmine. "Having a Disney princess that looked something like me, I think was really powerful," she said. But one thing that we're really excited about with this film is that she is going to have her own solo song. 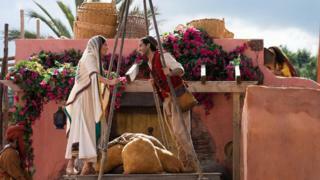 Will romance blossom for Aladdin and Jasmine? It has been written by composer Alan Menken with lyrics by the songwriters who worked on the Oscar-wining 2017 film La La Land. While Jasmine will still have her trusty tiger Rajah, the film will also include a new character called Dalia, who is Jasmine's handmaiden and best friend. "Jasmine is so resilient and independent in this version, she's focused on things other than which boy she's going to end up with," explains Nasim Pedrad, who will take on the role of Dalia. "She really wants to be a leader and Dalia really supports that, but at the same time wants to make sure she doesn't get in trouble." And fear not, Aladdin will also have his trusty sidekick Abu too! Will Smith is going to be playing the genie - and it sounds like he's going to be putting his own twist on things. "I think it'll stand out as unique even in the Disney world," Smith says. "There hasn't been a lot of that hip-hop flavour in Disney history." We also know he's going to be rocking a topknot. I can not WAIT until this film comes out! It's funny because my name's Jasmine and I love the movie Aladdin! Yay! Thank the gods! 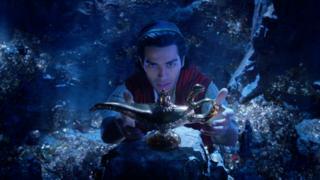 I love the film 'Aladdin'!